London Book Festival Honorable Mention-Best Spiritual Book International Book Awards Finalist Best Self-Help: Motivational Book Los Angels Book Festival Honorable Mention Best Spiritual Book Honorable Mention DIY Book Festival Best General Non-Fiction. A chance meeting on September 10, 2001 started a quest to help others that would change Rob Quillen's life forever. On a flight from Denver to Newark, New Jersey, he made the acquaintance of Captain Jason Dahl, pilot for United Airlines. During the flight, without an inkling of the tragedy that was to come, the two men became close friends, talking about dreams and what the future might hold. The next day, Dahl was piloting United Airlines Flight 93 when it crashed in a field in Shanksville, Pennsylvania during the infamous 9/11 terror attacks. Both Dahl and his son were NASCAR and Jeff Gordon fans; something they had in common with Rob Quillen. After 911, Quillen--with help from Jeff Gordon Enterprises and NASCAR--was able to arrange for Matt Dahl to attend a race at Kansas City Speedway October, 2001. Why Wait? 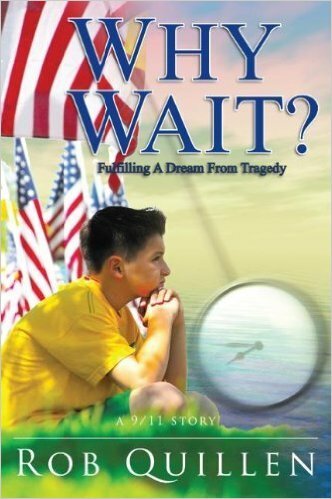 is a story that will inspire and encourage everyone to join the quest to help make the dreams of others come true. Greg Nelson has worked nationally with hundreds of financial professionals, entrepreneurs and business owners for over 25 years. His work has included educating, creating, and implementing effective income protection strategies. As a Disability Income Fellow (DIF) and a Group Benefits Disability Specialist (GBDS), and as someone who has used this important benefit, he is a fervent advocate for helping others to not make disability income protection "The Forgotten Insurance." Greg Nelson has worked nationally with hundreds of financial professionals, entrepreneurs and business owners for over 25 years. His work has included educating, creating, and implementing effective income protection strategies. As a Disability Income Fellow (DIF) and a Group Benefits Disability Specialist (GBDS), and as someone who has used this important benefit, he is a fervent advocate for helping others to not make disability income protection "The Forgotten Insurance." 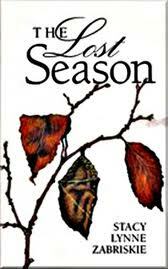 The Lost Season is a true-life story with the drama of a novel and the emotional impact to warm your heart. It offers other faith, hope and endurance through life's unexpected trials. Mr. and Mrs. Zabriskie were the keynote speakers at the 9th Annual IDIS Conference in New Orleans, LA. Craig Zabriskie, a handsome, young, successful businessman, with a beautiful wife and two small daughters, suddenly is in a tragic boating accident, which sets in motion a series of life-learning events that puts more than just his life in extreme recovery. While Craig and his wife, Lynne Zabriskie, are both madly in love with each other since high school, Craig is now faced with a traumatic brain injury where death will be easier to achieve than life. Lynne, unaware if her husband will even survive the night, is put into a situation she could have never prepared for. As Craig spends increasingly long hours, days and years rehabilitating his life, both mentally and physically, Lynne continues to raise their daughters and support her husband through his healing process with the help of disability insurance. Though a season of their lives will forever be lost... eventually, the Zabriskie family find their trial has become something even more than they could have imagined. A compelling book that proves the overcoming power of the human heart and mind. The Disability Income Training Manual, authored by Michael J. Eskra CLU, RHU, discusses the most pertinent aspects of disability income planning. 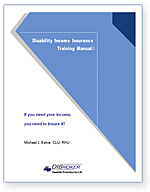 This comprehensive manual provides sales and marketing ideas that will prove helpful to just about anyone who markets disability income insurance to their clients. The complete manual is available to you for only $49.99. "If you are interested in improving your knowledge if Disability Income Insurance, then I strongly recommend that you purchase the excellent book authored by Michael Eskra which is the most authoritative and informative book on Disability Income Insurance to be published in the last 50 years." - Ken Wylie, nationally renown lecturer, teacher and trainer who has conducted thousands of training seminars in disability insurance.